It is an often difficult task to remember someone who has been lost at a joyous wedding ceremony but it can be done in many different ways – each to suit different tastes and the relationship itself. 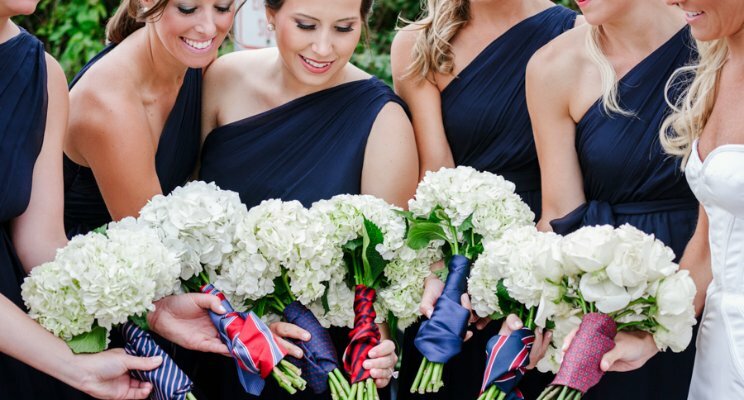 Wrap wedding bouquet(s) with a tie/scarf or other garment he/she wore. Use a charm/picture frame on the bride’s shoes, this especially works for a bride with a father or grandfather’s photo showing that male family member as symbolically walking the bride down the aisle at the wedding ceremony. A charm picture frame or locket can either be attached as a single photo to the wedding bouquet or numerous picture frames can be attached to ribbons flowing from the bouquet to enhance the look. Memorial pictures can be placed on a tree if outside or wall where the wedding ceremony is taking place. A quote could be attached stating “Those we love don’t go away, they walk beside us very day…unseen, unheard but always, near, still loved, still missed and very dear”. A memory table can be set up at the wedding venue to include photos, candles etc. – the photo above shows such a table. Candle(s) or a lantern can be symbolically lit, one for each family member at the beginning, during or at end of the wedding ceremony. A photo can be sewn inside the bride’s wedding gown. Leave a chair at the wedding ceremony and/or reception with an item of clothing, photograph, piece of jewellery, flowers, medal, hat (all or any). A sign stating the chair is for a deceased loved one as well – a photo is below. A handwritten note from a deceased loved can be sewn into the bride’s wedding dress or groom’s suit/tux. Cut a piece of man’s shirt and sew it onto the wedding dress in a heart or other shape (if it is blue – as something blue) or another accent. 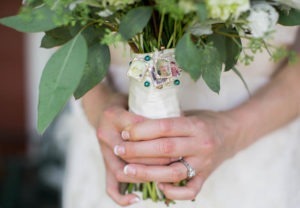 Carry a family heirloom he/she owned down the aisle (eg. Small book, purse, wallet etc. )….depending upon size! Use their favourite flowers in bouquet/boutonniere. For further information on our wedding celebrant services, please contact us.